The Typhoon H Thermal Camera CGO-ET is a plug-and-play thermal camera for the Yuneec Typhoon H Hexacopter which allows you to film in complete darkness and see hot spots and thermal signatures on the ground. 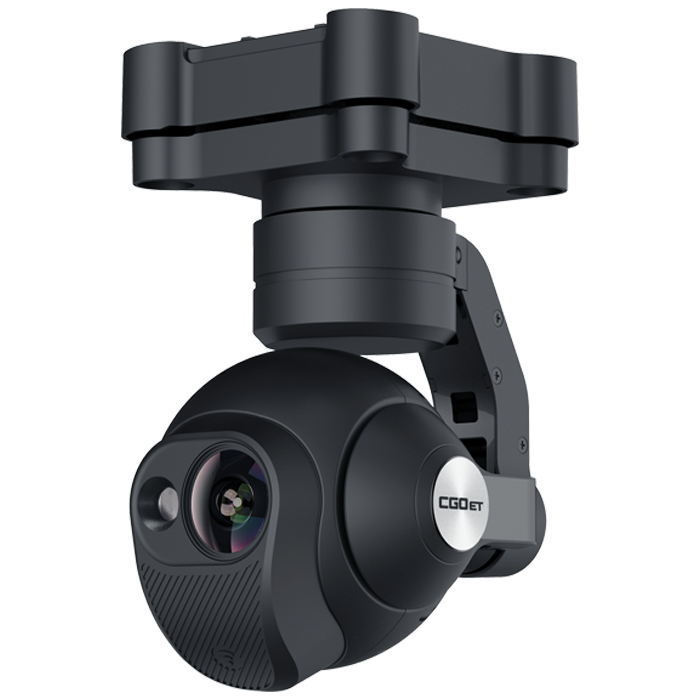 You can simply uninstall your original CGO3+ Camera and attach the new CGO-ET Thermal Camera directly onto your Typhoon H.
The 3-axis anti-vibration CGO-ET thermal infrared and low light RGB camera is a cost effective, safe and easy to use all-in-one solution for many applications such as construction, agriculture, forestry, fire fighting and rescue operations. While the infrared camera measures the temperature in the image and indicates relative temperature differences, the low light RGB camera has a twenty times higher light sensitivity compared to the human eye and takes excellent shots even in low light conditions. Both Thermal and Visual light feeds are simultaneously streamed to the 720p HD LCD screen on the ST16 Ground Station (not included) and can be viewed separately, picture-in-picture or as an overlay.